A quick note about g4u – g4u (Ghost for you) is a hard disk imaging tool similar to Norton Ghost, but without the cost. g4u allows you to image hard disks to both files and physical media. This can be accomplished within a physical machine, a virtual machine, or by using an FTP server on either of the two. Riverbed has announced that it will acquire Mazu Networks, NBA masters and creators of the CMDB tool Mazu Profiler. Full report at Mazu Networks’ site, and Riverbed’s. I have a pretty strong feeling that this will make clients of both happy. You can right-click just as if you were using a mouse, but without using your mouse, using the shift and F10 keys together. For example, if you’d like to extract a .RAR in a directory, simply press END, cursor up, then shift+F10 and extract! Voila! Easy as pie extract in every folder in windows with 4 keystrokes. More tips coming soon as the new year kicks off to a good start folks! We will also be giving away some codes for elo boost services from elitist-gaming.com! Note that while these cheats may unlock cars that you want to own, the only one I would recommend is the Pagani Zonda R, for use in your first season. Here’s why: much of the money you get from this game is through sponsors. When driving any of these cars, you will not get any sponsor money, as they are all ready “branded”, to use the GRID term. That said, it’s pretty neat to unlock all of the drift cars as I find those events next to impossible, and some of you may find that having the muscle cars unlocked is a nifty trick. Finally, if you want to race the car you’ve unlocked and have the money, you can actually purchase a new car, brand it, slap some sponsor logos on it, and you can race that to you heart’s content while being showered with oodles of dough in the hopes of signing some million dollar rookie. – Unlock vans and you can race with them.Really fun. Though the Citrix client comes as part of the default install on SuSE Linux Enterprise Desktop, unfortunately the root certificate is not installed for the Citrix ICA client, and furthermore requires an extension that is slightly different than the certificate vendor’s version. Browse to your Citrix web gateway again and login, then run an application. I have a Call of Duty: WaW beta code that I don’t need. I’m going to do a random draw from the first 25 responses, then give it away! So far, the beta is awesome. This isn’t CoD4, but pretty darn good just the same. 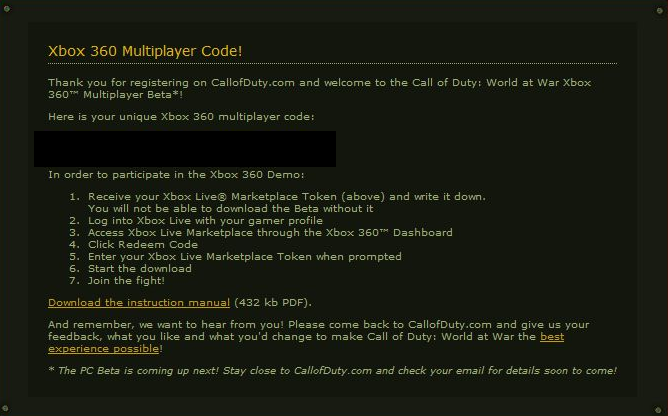 Thank you for registering on CallofDuty.com and welcome to the Call of Duty: World at War Xbox 360™ Multiplayer Beta*! 1. Receive your Xbox Live® Marketplace Token (above) and write it down. Download the instruction manual (432 kb PDF). And remember, we want to hear from you! Please come back to CallofDuty.com and give us your feedback, what you like and what you’d change to make Call of Duty: World at War the best experience possible! * The PC Beta is coming up next! Stay close to CallofDuty.com and check your email for details soon to come! How do I install .kext files? So without further ado, here is the script that will install kext files for you – be warned – you’ll need to know how to get the kext file in the first place, as well as the filename. Open the Terminal application by going to Applications / Utilities / Terminal.app – you will see it in the Utilities folder – it looks like a command prompt. Enter the root or first user password that you inputted during the setup process. This tells it to run any other commands after this one as the root or superuser account, allowing you to edit files you normally would not have permission to edit.